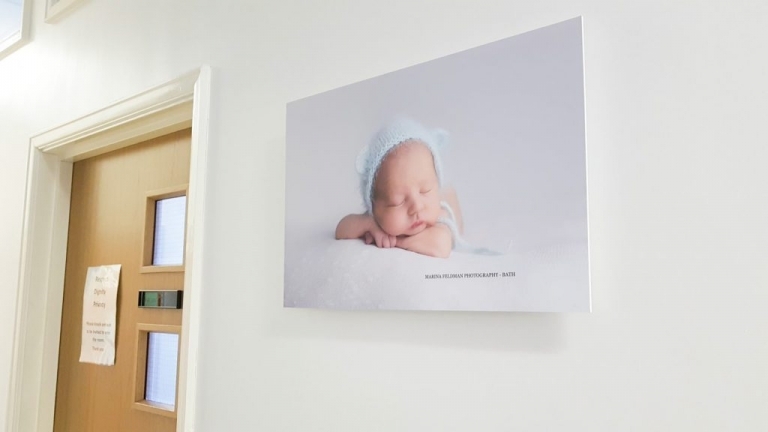 I was honoured to be able to provide some canvases to liven up the walls of Paulton Birth Centre near Bath. Bath maternity unit and the midwife led birthing centre at Paulton are the two closest maternity units near me and a large proportion of my clients give birth there. 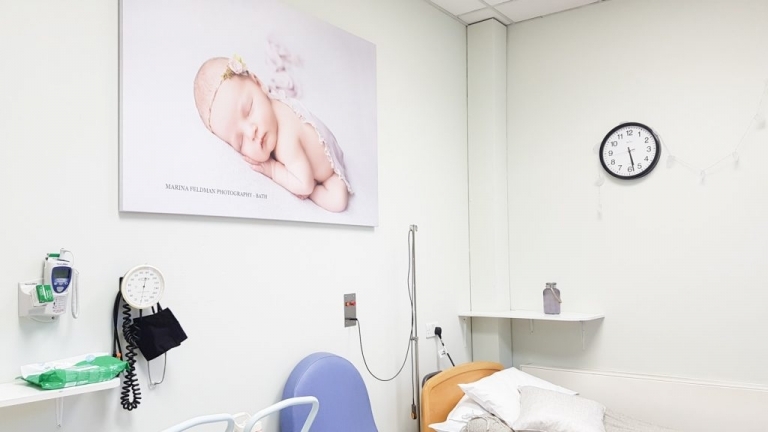 When midwives Claire and Jen asked for wall art to decorate the birthing rooms, I was ever so happy to be able to gift them canvases of my work. The babies on these canvases were all either born at Paulton birthing centre, or cared for by the midwives there and delivered at the Princess Ann Wing Bath maternity unit. It is extra special for the lovely ladies working there to know that the babies on these images were delivered by them! I too was cared for at Paulton birthing centre for my 2 pregnancies and it was lovely to be back there and to see all of the hard work the midwives had put in making the centre so homely, thanks to their hard work and the generosity of the people who donated LED candles, fairy lights, brand new blinds and other accessories to the unit. When I met with Claire and Jen to discuss the size of the canvases they would like, we decided that they would have to be big to actually fill the huge walls. The 2 large canvases are 60 inches by 40 inches and to give you an idea of their size, here is a photo of them in my living room. Pretty big! Needless to say that I would have been unable to fit these by myself and had to enrol my IT team (aka my husband Jon!) to fit these on the wall. The 2 large ones now decorate the pool room and the blue room (which I think is now the green room!). 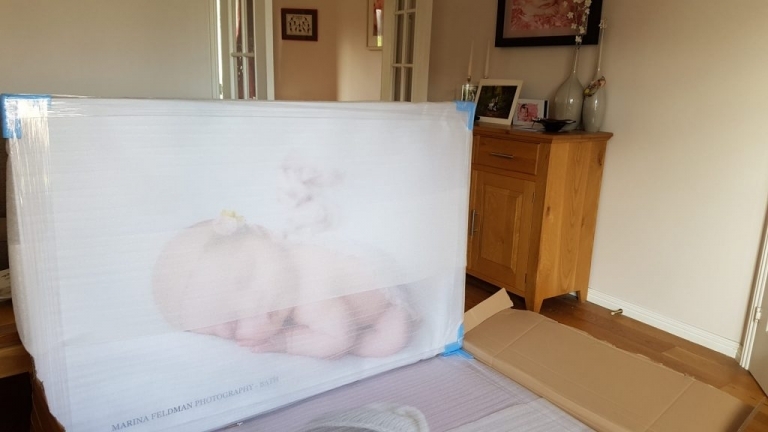 The smaller ones are light mounted prints sealed onto a sleek upvc backing and have been placed on the ward, the dining room and in Timmy’s room. Here are a few photos taken after they were installed. If you are looking at this post because you are thinking of giving birth there, please go and visit the birthing centre, the midwives are so lovely and work so hard to make you feel at home. It’s never too early to book your newborn photography session. Most mums to be contact me at the beginning of the second trimester to ensure their place is reserved in order to capture those cute, sleepy newborn poses during the first couple of weeks of them being born. 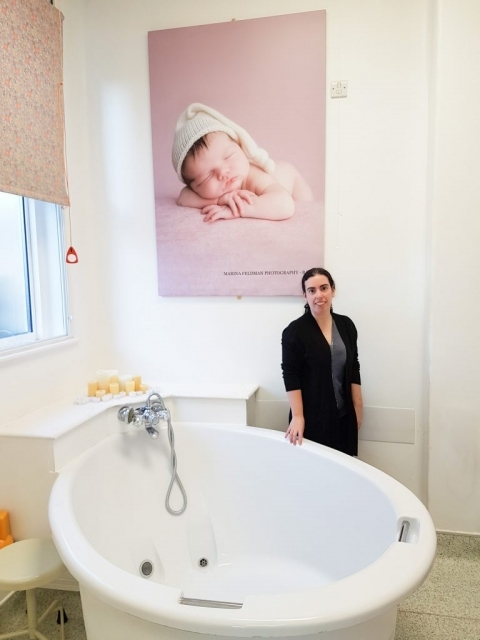 Marina Feldman is Bath newborn baby photographer based and covers Bath, Somerset and covers Bath, Bristol and the South West of England. OMG!!!! I’m totally in love! To choose Your work to decorate their clinic is really a good choice!!! You’re The photographer for that, for maternity and baby shooting… Vous êtes une superbe photographe!